Depart Toronto at 1:00 pm. 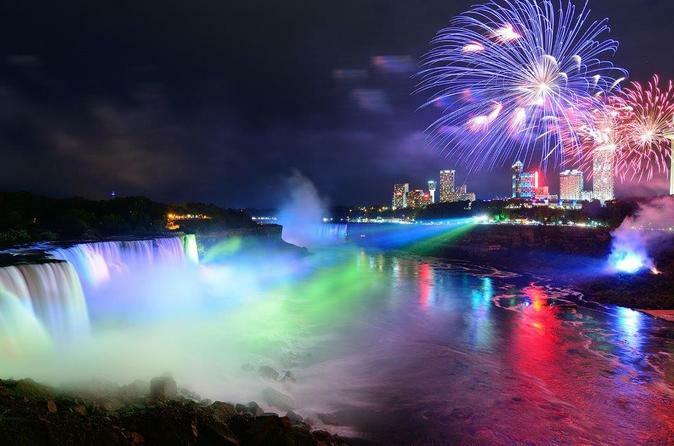 Visit the Falls during the day and view a spectacular light display at night. Make a stop at the winery and sample one of Ontario's finest wines. You will have plenty of time to explore the falls on your own. Take a look at the Falls in a different view with our following options (prices includes admission). Tour Departs Toronto at 1:00 pm, every Wednesday, Friday and Sunday. Complimentary pick up is available at selected downtown hotels. Please call the tour operator to make arrangements. Head to the Falls on a luxurious air conditioned, washroom equipped motor coach and be entertained by our licensed tour guides. Enjoy an exhilarating ride on the Hornblower Boat Cruise or soar the skies at 175 ft. above the Falls on the SkyWheel. Plenty of free time to explore the Falls on your own, including Clifton Hill, Museums, Arcades, Casinos and more.